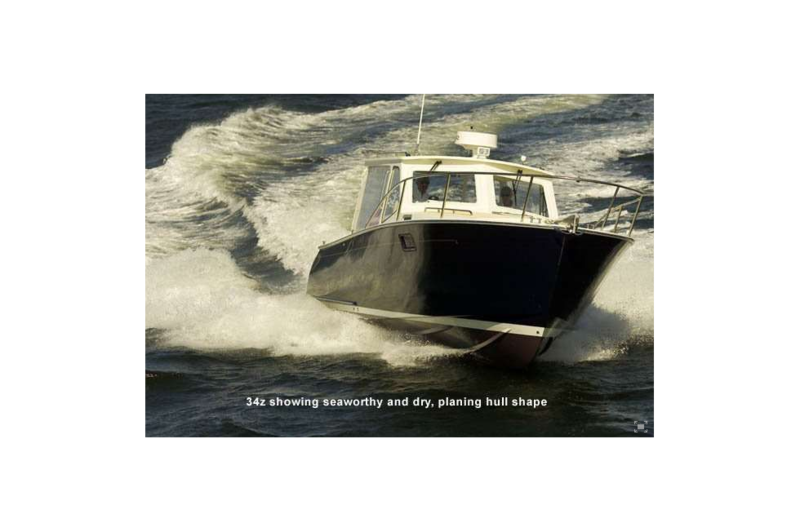 Modified deep-V, offshore hull design with sharp entry and moderate beam having dual lifting strakes, chine flats, 18-degree transom deadrise carried forward 11 feet, for stability and level acceleration, and with prop pocket for shoal draft operation. Solid unidirectional E-glass/epoxy GRP centerline keel/backbone and chines with structural grid to minimize damage from grounding and to exceed 2004 draft CE Mark (ISO) structural standards for an Ocean Category A vessel. Solid glass or high-compression Penske-Board coring with rebated outer/inner skin bonding in way of thru-hull fittings or thru-bolted hardware. Hull is gelcoat off-white in color with single color cove and chine stripe. Bilges, finished with smooth, easy-to-clean, gloss-white finish. PVC guardrail with high-polish stainless rub strip. 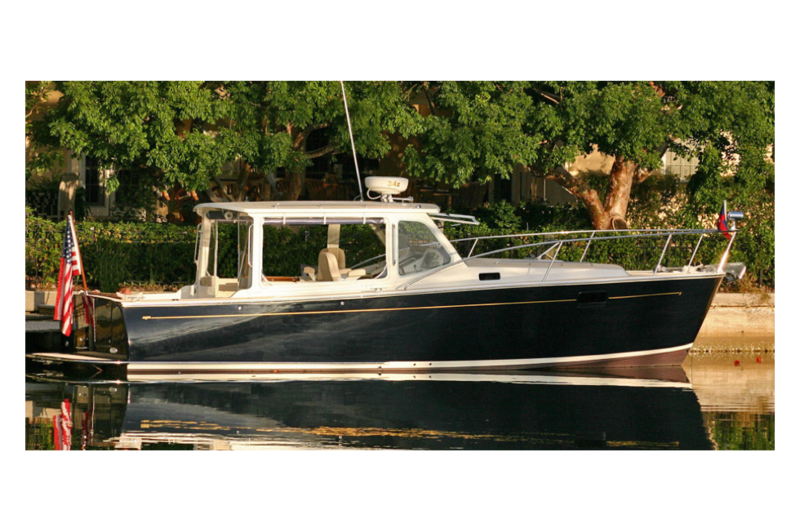 Large, tinted Lewmar through-hull opening ports in saloon w/screens and pull-down shades. Molded quarter-guard with stainless steel rubstrake. High-tech composite construction under vacuum using oven post-cured epoxy impregnated, stitched biaxial E-glass and 1” CK100 Baltek cored laminate. Solid glass or high compression Penske Board core in way of all thru bolted hardware and over-sized epoxy G-10 pressure- laminated composite backing plates for all cleats and stanchions. Hull to deck fused together as monocoque structure with cyano-acrylate adhesive with a shear strength of 1.5 tons per square inch and with mechanical fasteners of the gunwale guard on 8-10” centers. Exceptionally strong, fully-molded (inside & out) and gelcoated windshield frame/posts with hardtop. Cook “Armor Flex” off-white gelcoat deck w/sand-textured non- skid. Contrasting non-skid color is an option.Transom door with heavy-duty latch & retainer clip when open. 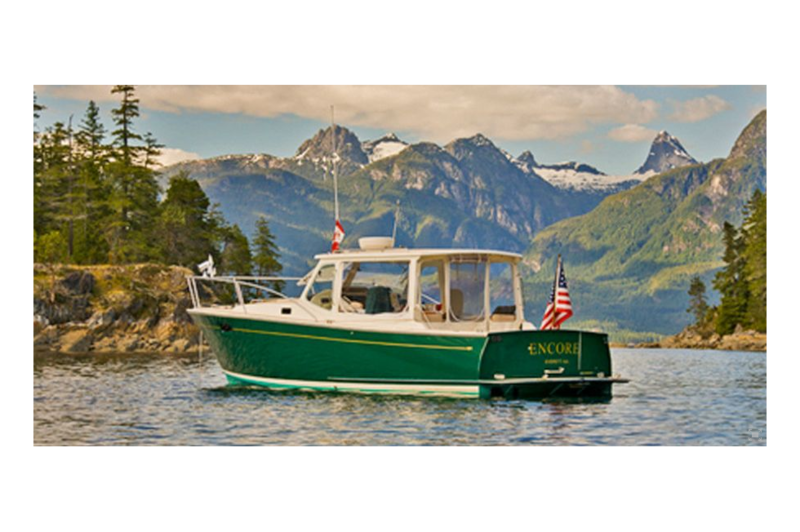 Convertible pilothouse enclosed by clear, roll-up, vinyl windows with Oyster Sunbrella border. Windows and aft entry door with combo window/screen roll-up in place. Dual fully-opening windshields with safety glass and electric wiper/washers. Clamcleats P&S to retain 35’ bow lines in cockpit, immediately accessible for docking without going on foredeck. Deck drains divert dirt/soot/dew/rain into gray water system and out transom…rather than onto topsides. 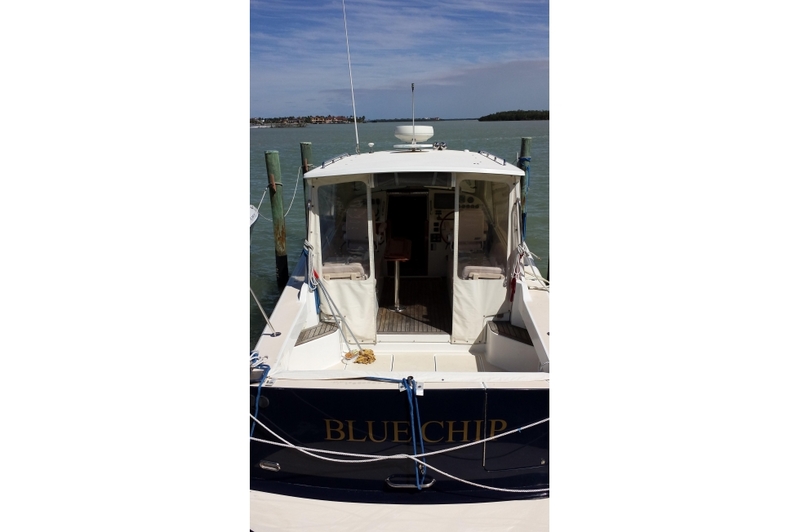 1” Stainless handrails (6 pairs) on cabin trunk, pilothouse roof, side windshield frame, aft of pilothouse for boarding and under pilothouse roof aft of piloting chairs and companionway entrance. Molded boarding steps (P&S) in cockpit. Flush-top cockpit coamings for comfortable seating, ease of boarding and fishing. Large storage compartments under cockpit sole (2) with hinged lids, overboard drains and lockdown seals capable of holding deflated Avon Redcrest dinghy, offshore survival raft, or optional fish box. 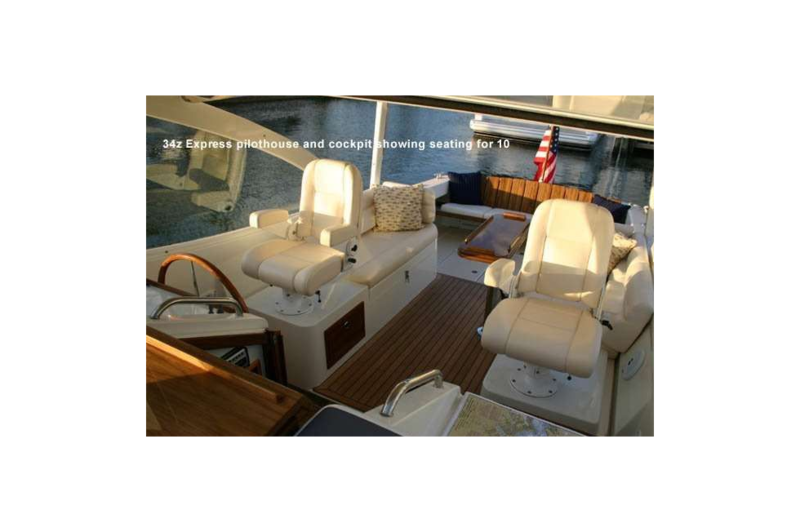 20”W x72”L x40”H pilothouse settee lockers P&S w/piston-activated lockable lids. Lockers have vinyl flooring and mesh storage bags for fenders, docklines, power cords, hoses, mountain bike, hard luggage and/or golf club storage. Large, varnished teak storage drawers (2) under piloting seats. 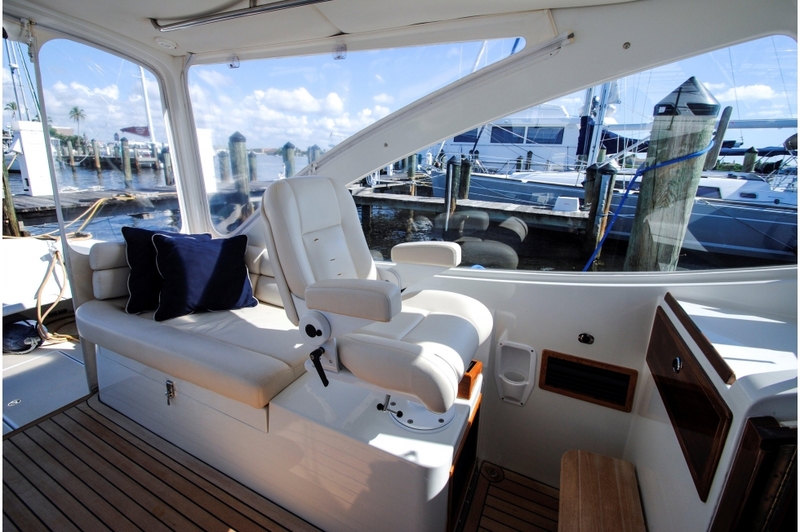 Pilothouse settees with Sunbrella cushions and backrests. Settees convert to two 2’x6.5’ berths. Lewmar 20x20 deck hatch with screen and draw-shade. Opening ports with screens (2) over galley & head. 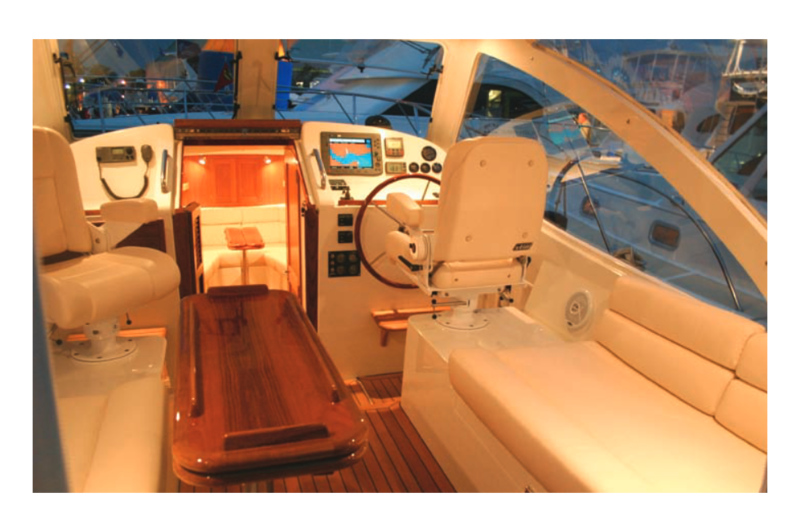 Gloss-varnished teak bi-fold companionway door and 4- section hinged cover with brass combo lock. 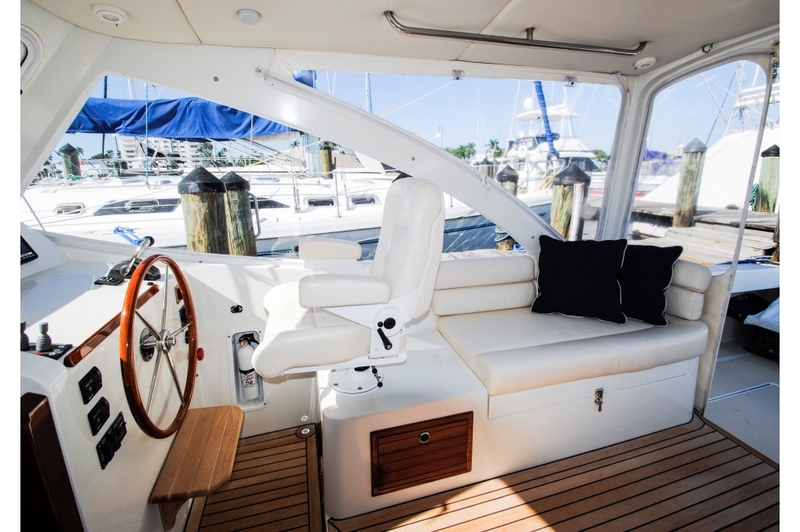 Matched Bentley Rivermaster piloting seats in Light Oyster Ultraleather on swiveling bases with sliders. 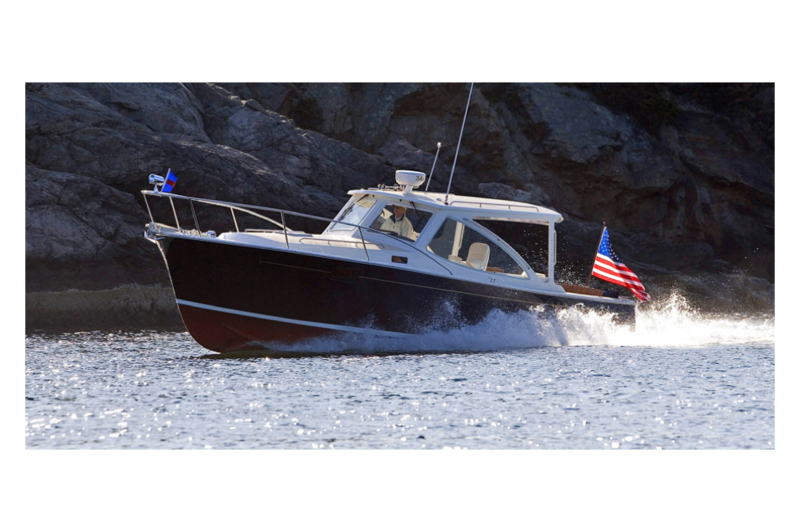 Pilothouse deck hinges upward 40 degrees on power screw lifts for engine compartment access. Bi-level instrument console with gray anti-glare top surface for multi-function navigational display; controls and instruments. Ritchie SS-2000 4.5” flush-mount, high-performance, Supersport compass with movable sunshield. Navigation center to port with 25x17 surface for Chart kit and/or laptop and 4" deep drawer plus panel for VHF or phone hookups. 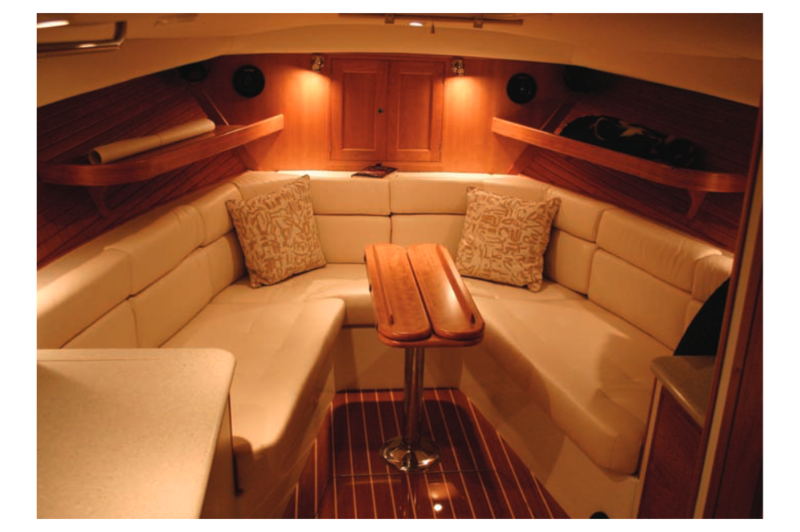 Gloss-varnished teak 36x15 table with dual sockets, in pilothouse and below in saloon. 3x5 American flag with teak staff and retainer pin.. 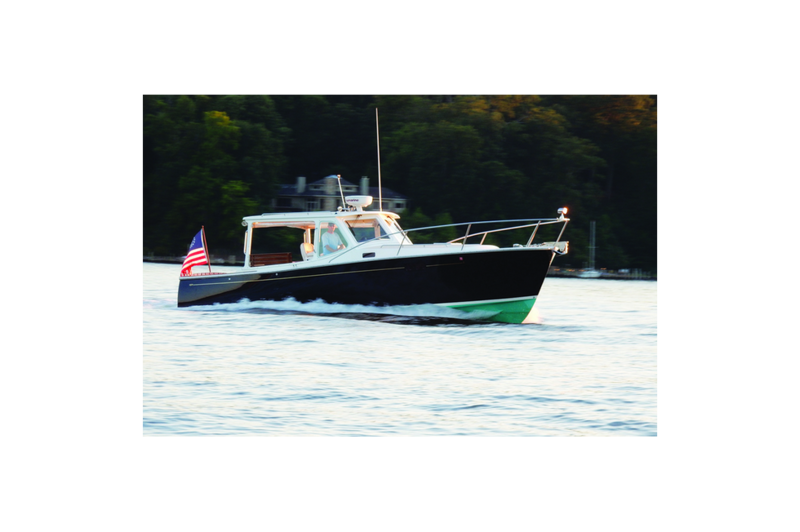 Single Yanmar 380 hp 6LY3-UTP 380 horsepower, electronically controlled, 24 valve, 6-cylinder, freshwater cooled, turbo-charged diesel. Kansecki high performance 7 degree down-angle transmission with 2.4:1 gear ratio. Standard Yanmar 80 amp alternator. Standing engine-room access by means of an electronically- elevated bridgedeck with 4 part tackle for emergency backup and safety. Single-lever electronic shift and throttle control for optimum response. Digital engine display for tachometer/engine hours, oil pressure, water temperature, fuel level, fuel consumption rate, and much more. Yanmar engine spares kit and service manual. UL approved fuel shutoff and fuel/air separators. 900 Series Racor fuel filter with spare cartridge. Manganese bronze strut with cutlass bearing. 2.0” Aquamet 22 stainless shaft w/4-blade computer milled Acme Prop w/Right Hand Rotation. PSS dripless shaft seal w/zinc retainer ring. Interconnected, bright-finished and coated aluminum fuel tanks (2) w/148 gallon capacity with Wema SUF American standard fuel level sensor. Parker 221FR fire resistant USCG Class 1 high-tensile, steel- wire-braid-reinforced, fuel hoses. Marelon engine raw water intake seacock with bronze strainer and fresh water (and emergency bilge pump) engine flush. High-density, sound-absorbing tiles over prop pocket. Stainless engine air intakes (4) under coamings. Fiberglass drip pan below engine and transmission. Seafire automatic fire suppressant system in engine compartment with portable extinguisher in cockpit. Custom built MJM hinge-out, backlit electrical panel with 25-12v DC breakers, stainless breaker guards and digital DC monitor. Overhead halogen lights in galley (3), head (2), saloon (2), piloting console (2) and pilothouse (2) on 3 dimmer switches. Courtesy lights (4) in cockpit, saloon and head. 505-ampere hour absorbed glass-mat battery capacity with 2- Group 4D 200 AH house and 1-Group 31 105 AH engine-start battery. Field serviceable electrical system with bundled/numbered w/Deutsch O-ring waterproof connectors. Edson 24" stainless steel destroyer wheel. Teleflex Sea Star manual hydraulic steering with heavy-duty brass cylinder. Large Aqualoy 22 stainless steel plate rudder blade. Recessed Lenco electric trim-tabs with console control. Pressure hot/cold water for galley with Shurflo Smart Sensor microprocessor controlled with variable-speed water pressure pump w/10-gal. water heater and 58-gal. fresh water tank. 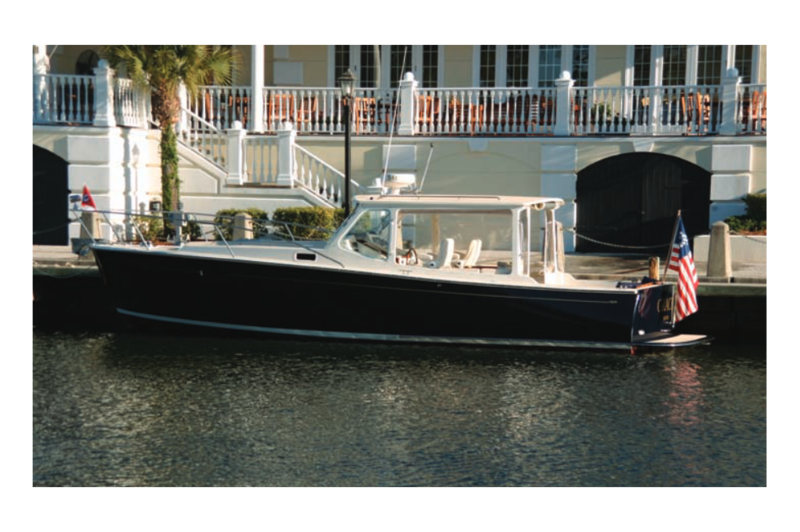 Two Shurflo 1000 automatic bilge pumps in bow and midships compartments isolated by the main bulkhead under the wheel. Vacuflush head system with 20 gallon holding tank (only uses cupful of freshwater per flush) w/ marina pump out and overboard macerator discharge. Back-up Bosworth high-capacity cockpit-operated manual bilge pump. Centralized gray water discharge system through transom to minimize thru-hulls. Gray water sump with strainer and clear inspection port for shower, icebox and AC condensate. Marelon non-corrosive thru-hulls/seacocks with strainers and double-clamped hose connections. Large wrap-around saloon lounge with 5” bolstered Ultraleather cushions in color of choice. 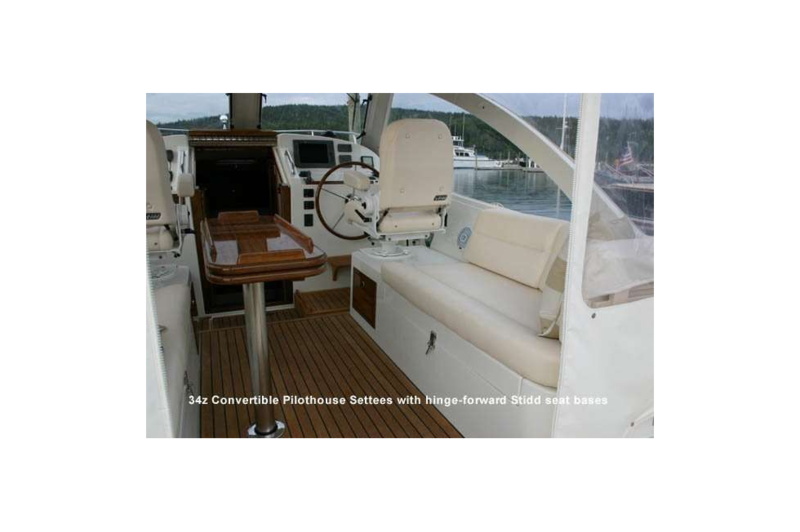 Converts to two large twin-berths 24”x84”. Optional Double-berth insert and cushion fillers. Satin-varnished cherry framed off-white laminate (classic Herreshoff look) bulkhead forward with cherry access doors to large forepeak anchor locker. Optional all-cherry finish. Off-white laminated paneling with cherry trim. Pushbutton latches on cabinet sliders, doors and drawers. Gloss varnished teak & holly cabin sole w/storage locker. 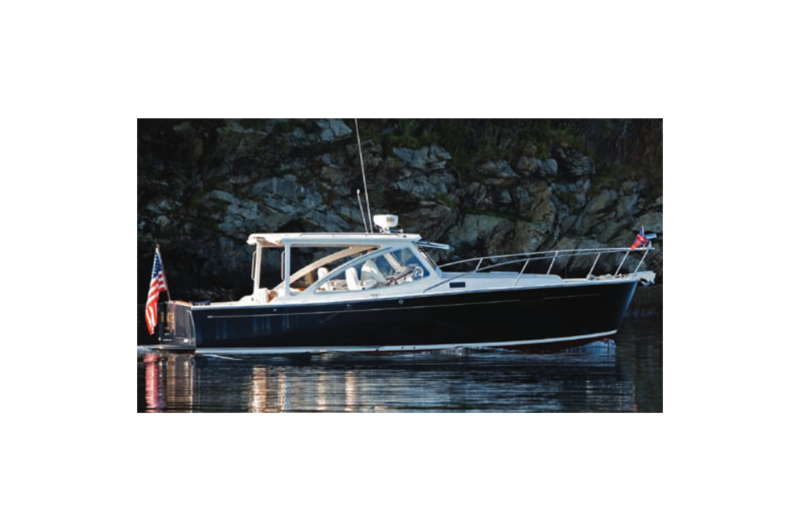 Privacy pull shades over hull ports and forepeak hatch. Oyster Corian counter-tops in galley, side table and head. Poly storage bins (3) under saloon settee. Satin-finished cherry bureau unit to starboard with cabinet, wine rack and book shelf above and 3 drawers below. Off-white, foam backed vinyl headliner & hull liner. 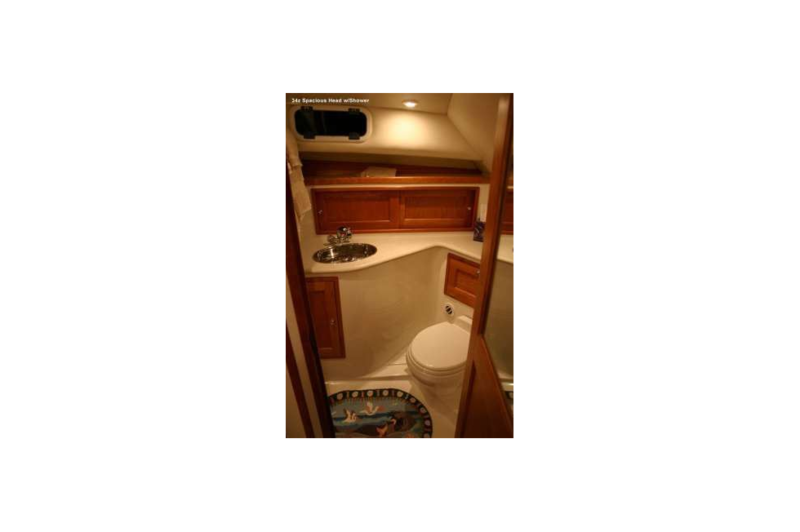 Head door, when open, serves as large dressing mirror and privacy door, blocking view from pilothouse without having to close companionway entrance. Supplemental 8x12 dressing mirror in main saloon. 2-section louvered teak companionway door. 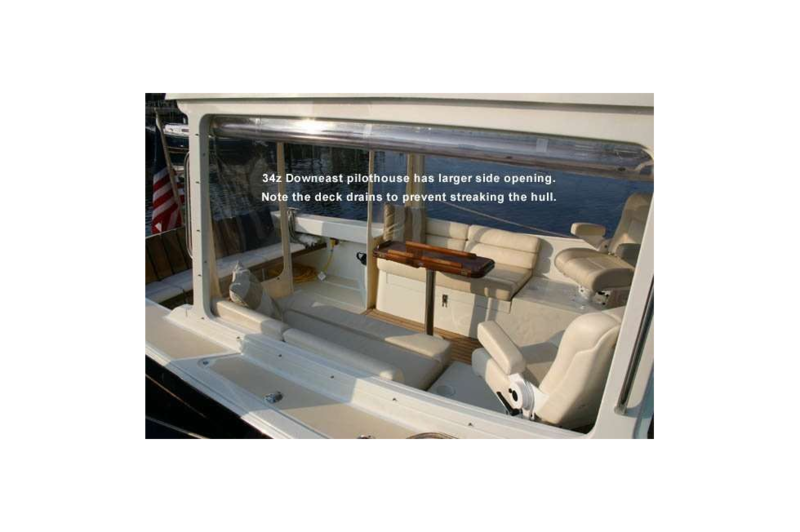 Electrical panels are mounted on recessed, hinge-out door to starboard of companionway entrance. Teak companionway steps with tool storage. Table mounting socket for standard 36x15 gloss-varnished dual position table. Recessed polished SS sink with removable Corian cover. Large top-loading 5.5 cu ft. ice box w/dividers, organizer baskets and drain to gray water sump. Large, above-counter 2-sliding door storage cabinet with shelf. Storage locker with shelf for pots/pans and cleaning supplies under sink. Flip panel to large Rubbermaid trash bin. Overhead safety handrail and towel drying bar. Shelf for storage of owner supplied Origo 2- Burner Stove or optional Microwave. Double stainless hook for hotpads and dishtowel. 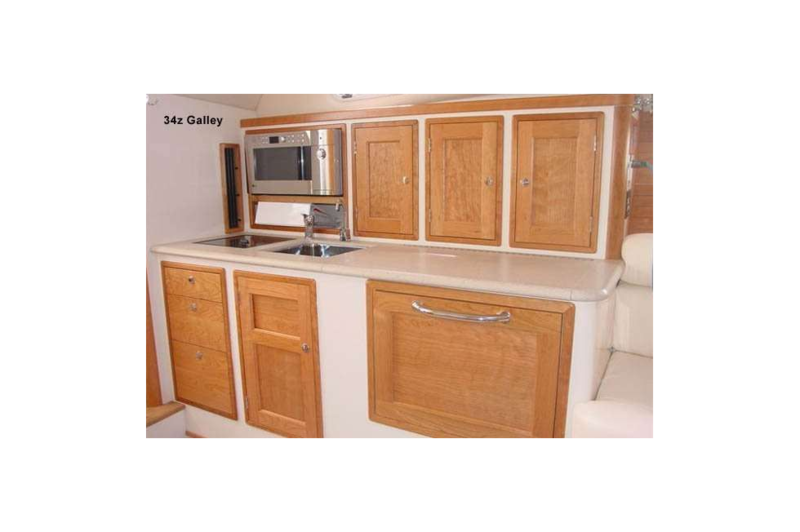 The Cruising Galley option includes Refrigerator Drawer, Seagull Water Purifier; Princess Single-Burner Ceramic Cooktop, Seafrost 12-volt Refrigeration and Microwave Oven and Toaster.